Today is a day of remembrance and parades, picnics and celebrations. Here’s hoping you and yours have a wonderful holiday together! 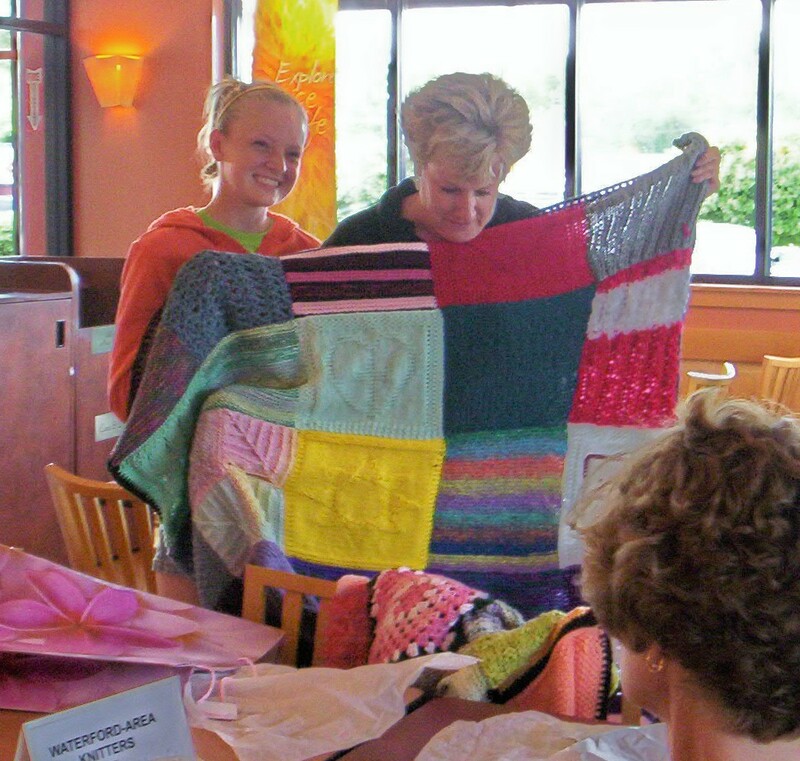 Last night was the delivery of “Dawn’s Afghan” and it was totally wonderful! 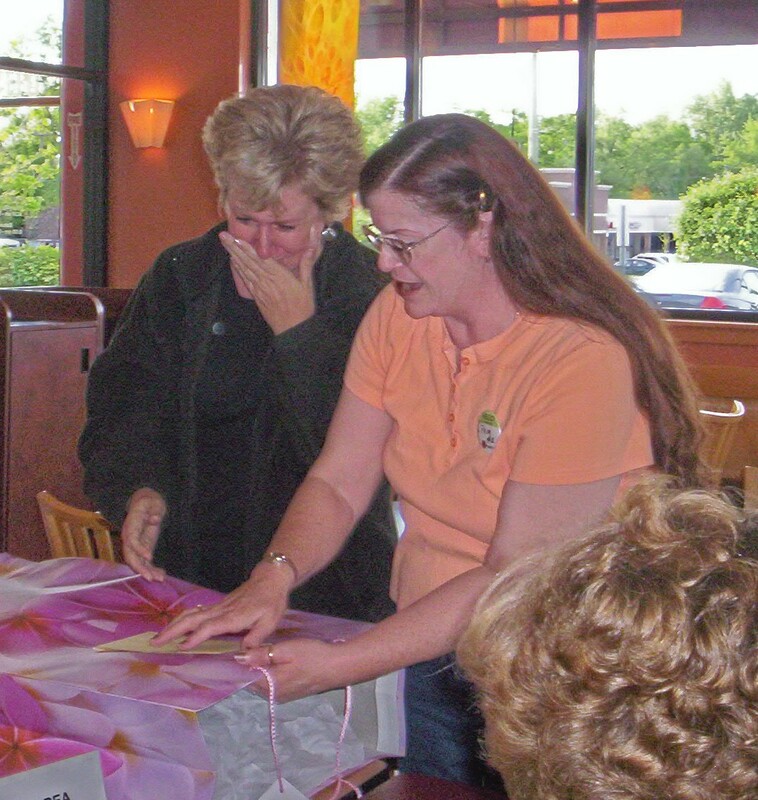 She cried, we totally surprised her, we were happy – mission complete! Enjoy the photos – click to enlarge. I told Dawn how we were trying so hard to complete the afghan before she got her closing and had to start packing and moving; she still hasn’t heard when her closing is. She said: “So THAT’S it? THAT’S what was holding up the closing – the afghan?” I said: “Yep! Now that it’s complete, you’ll get your closing any time now!” (big grin inserted here). She just laughed. Middle son works for Gordon Food Services and they are currently featuring a “Fresh Broccoli Salad KIT“; at his recommendation I bought one. Mind you, my ‘frugal’ side was whining big-time, but I told it to take a hike and just bought it. This is one of those recipes you save for parties or picnics – really simple, and really, REALLY tasty! Since I didn’t exactly have a recipe for the dressing I visited my favorite recipe ghuru: AllRecipes.com and managed to find several variations on said salad. (below are 2). Combine the broccoli, onions, raisins, and sunflower seeds. In a small bowl, whisk the yogurt, orange juice, and mayonnaise until blended. Pour over the broccoli mixture and toss to coat. It’s one of those recipes you can fiddle with, adding a bit of this, omitting a bit of that – to your liking. All I can say is – it’s a KEEPER! While going through my emails today, an idea popped to the front: why not just blog about a great picnic menu? Since Memorial Day weekend is quickly approaching, perhaps some (or all) of these will help grace your picnic tables! Cook and drain pasta as directed on package, adding pea pods for last minute of cooking. Rinse with cold water; drain. Meanwhile, mix bell peppers, carrots, basil and cheese in very large (4-quart) bowl. Mix dressing and milk in small bowl with wire whisk. Add dressing mixture, pasta and pea pods to bell pepper mixture; toss to coat. Fry bacon until crisp. Drain. Fill a 3-quart saucepan three-quarters of the way full. Bring to a boil. While water is heating, fill a large bowl with ice and cold water. Add broccoli to boiling water and cook for 1 minute. Immediately drain and plunge into ice water. Drain and transfer to a salad bowl. Add almonds, raisins, cheese, and onion. In a small bowl, whisk together mayonnaise, vinegar and sugar. Pour over broccoli mixture and toss well. Mix in half of the bacon. Crumble the remaining baconover the top of the salad just before serving. Pour buttermilk into shallow glass or plastic bowl. Add chicken; turn to coat. Let stand 5 minutes. Meanwhile, in 2-quart resealable food-storage plastic bag, crush cereal with rolling pin. Add Bisquick mix and dressing mix (dry) to cereal in bag. Remove chicken from buttermilk; discard buttermilk. Add chicken to cereal mixture. Seal bag; shake to coat. Place chicken on cookie sheet. Spray with cooking spray. Bake 45 to 50 minutes or until juice of chicken is clear when center of thickest part is cut (170°F). In a large bowl, combine the first five ingredients. Press onto the bottom of a greased 15 x 10 inch baking pan. Bake 15 to 18 minutes or until golden brown. In a large bowl, combine the filling ingredients. Spread over the hot crust. Bake for 15 minutes or until set. Cool on a wire rack for 30 minutes. Spread the melted chocolate over the filling. Sprinkle with the walnuts. Cool completely. Cut into bars. See what I mean? I really like simple, not-too-many ingredient recipes (although the ones above are definite exceptions – they all sounded so good!). 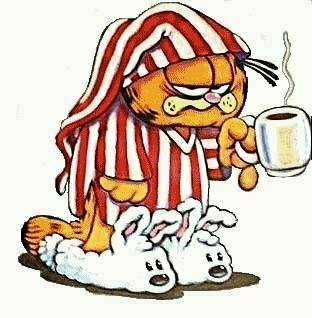 These past four days I’ve been struggling with (as my husband labeled it: Rhinovirus – read: stuffed head & nose, feeling not sick enough to go to bed, just feeling lousy/dragging.) I know I’ll be better soon, just don’t feel too productive lately. Got the laundry caught up yesterday ( a little at a time) but just didn’t have the energy to go grocery shopping (think I’ll put that one off until Monday). Read 3/4’s of a so-so book I bought on sale at the library for $1.25 – it’s OK for a ‘light novel’ – kept me interested but didn’t require a whole lot of ‘brain power’, which is what I needed yesterday. Will finish it today while reclining in my chair, trying to ‘get better’. It’s cooled down here to the low 60’s; rained last night quite a bit and today it’s just grey and wet outside, no rain. Not complaining – it looks like I ‘feel’! Another “Day in the Life” . . .
As you well know, having children is expecting the ‘unexpected’; this goes for youngest son right now. I wrote about his choral concert Tuesday evening but what I didn’t write about until now is the ‘event’ which happened Monday during school. My youngest loves to play hackey-sack (for those of you who don’t know what that is – it’s kicking a small cloth ball with your feet, doing tricks with it and playing with others. Goal: keep the ball moving without dropping it or using your hands.) The kids play this during lunch period at school and Monday was no different. Youngest tells me he’s considered one of two in their school who are ‘The Best’ at the game. It was during one of these games that a friend of his went to kick the ‘sack’ when it was near Youngest’s hand – friend wears ‘combat boots’ to ‘hack’ in – boot got too close to hand/enter LOUD CRUNCH sound – possible broken right thumb. Now my youngest is a very headstrong individual and when he came home from school and told me what happened I, like most parents, said: “Let’s go get that checked out at the hospital.” Right now I don’t remember exactly what reasoning caused me to say OK to his “No, not right now – let’s wait and see if it still hurts tomorrow” idea, but we waited. Now I should tell you – Tuesdays he goes to school, then Bible Study after school – usually gets home around 4/4:30 BUT this particular Tuesday was THE CONCERT so that killed any ‘going to get it checked out’ that day. Wednesday came and, you guessed it, he had another ‘excuse’ – this time his pastor had asked him to do the church bus monitor, which meant that pastor would pick him up at our house at 4:15 – another day gone. FINALLY- Thursday! Well, Thursday is another Bible Study day plus it’s my babysitting grandson day. Youngest got home late (had to help on the bus route) and agreed that today would be a good day to get it checked out. Lovely! Pack up sleeping grandson and proceed to hospital facility (mind you-it’s 6:10 p.m.!). After long stay and x-rays, it seems he has a hairline fracture along the bottom bone in his thumb. Big splint, note from doctor that he can’t write, directions to call and make appointment with Hand Specialist, and really neat DVD with his x-rays on it that we could look at (before giving to specialist). Ah, the fun! Now I have to locate the specialist and make an appointment. I’m wondering if he did any extra damage by waiting FOUR DAYS but there’s no worrying about that now! Yep, raising head-strong boys is not a fun thing, at times! (note: 3 1/2 yr old grandson did just fine all that time, even charmed the lady doctors by informing them of the “fire exit charts” on the back of the doors (he asked me what it was and I explained, so then he took his newly found knowledge and put it to good use – flirting with the ladies!). I guess I should be really flattered – the lady who checked us out at the end thought that my grandson was my son! She said something about how helpful Youngest’s little BROTHER was! 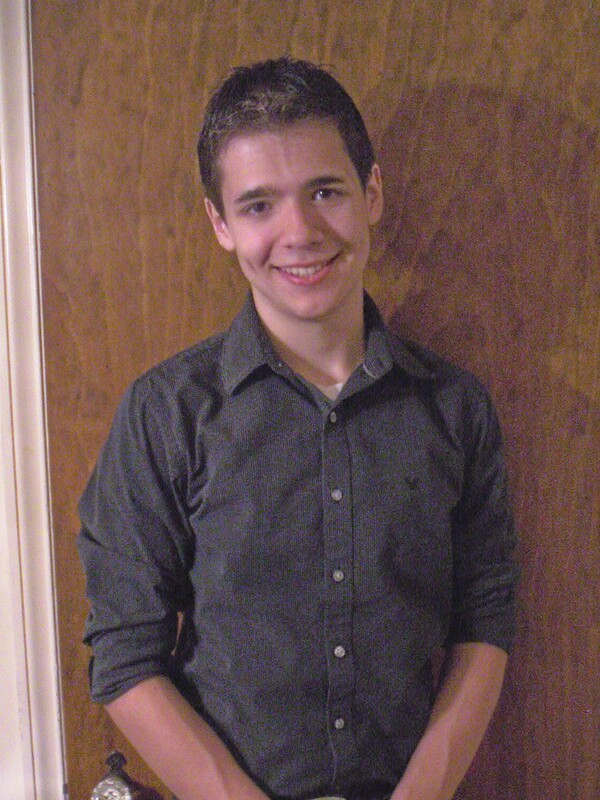 Last night I got to enjoy my youngest son’s “Collage Concert” (end of the year). It was 2 1/2 hours long and featured all choirs plus all instrumental groups including the jazz band, marching band as well as several smaller groups. He sang in three groups and did something like 5-6 numbers. When I ran into him in the halls afterwards he asked me, on a scale of 1-10, what did I think it ranked? I told him I’d give it a 9 1/2 (only because the girls chorus was ‘iffy’ and the brass group was waaay out of beat for almost the entire song – because they weren’t watching the lead trumpet – oh well…that’s high school for ya). It was a well thought out concert, with variety in between numbers. For instance, they would have a full concert orchestra number and then the minute they finished their piece, a spotlight would go on in the balcony and a solo (or duet) would start the next number. They’d asked that we not applaud until the end of the concert (I can’t imagine how long it would have been if we DID!). The whole concert ‘moved along’ quite nicely and I was very glad I went. Youngest son asked if I would take a photo of him in one of his ‘outfits’ and feature it on my blog so I said I’d comply. For this number the guys all wore black shirts & pants and the girls wore red tops and black skirts; it was a jazzy number complete with a little choreography thrown in! 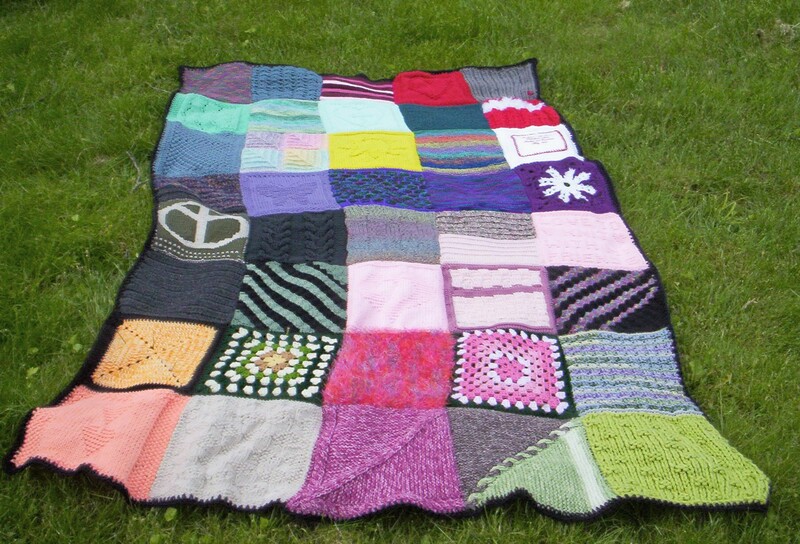 As you can see we have a plethora of various designs: several hearts, a peace sign, a sun, butterfly, a white snowflake; lots of talent and lots of love went into the production of this afghan. I know she’ll love it (plan on taking photos of the ‘delivery’ and will post here). Delivery date is scheduled for May 25th. All’s Quiet . . . So Far! Today is another glorious sunny day (temps around 62) so I’m hoping (once youngest gets up) to go upstairs and get the iron-on stuff that adhears cloth to cloth (don’t know what it’s called) and then iron on the embroidered patches to the last knit square. I’m still thinking about somehow decorating the edges of the cloth square with either yarn or embroidery floss in a sort of blanket stitch border, but that’s still to be thought out. The lady who did the embroidered square left the edges done in ‘pinking’ scissors, so it doesn’t make for a very easy edge. I ‘could’ roll the edge a little to make it straight, but she didn’t allow for very much edge from stitching to outside edge, so I’m thinking: iron it on with the fabric stuff, then using a very tiny white stitch, tack it onto the knit square. 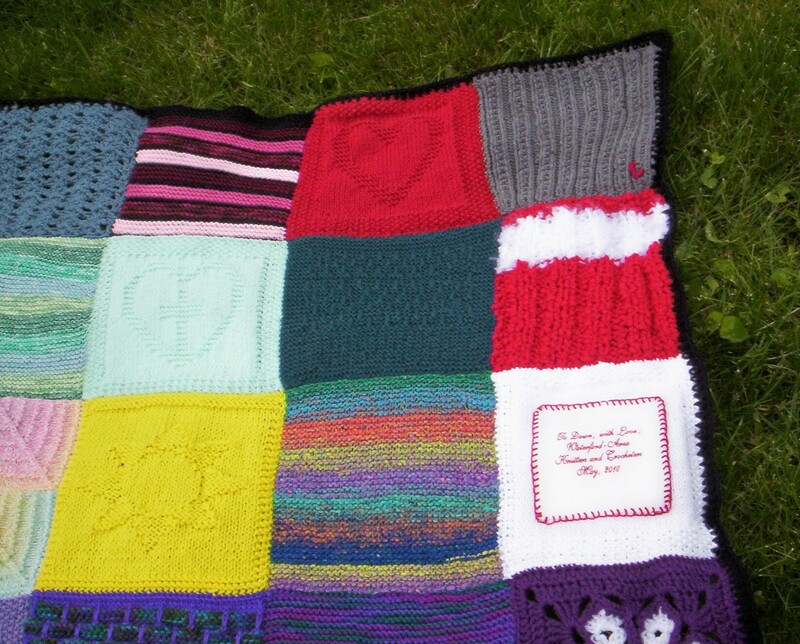 After that I might do the blanket stitch in red yarn – all depends on my mood by then. Since it’s such a lovely sunny day, am hoping to finally FINISH this and photo it outside in the grass!!! That’s my plan, anyway! Got a very nice HUGE gift bag yesterday at our local dollar store (love that place!). It’s a kind of tacky dollar store but their one redeeming quality is they sell ALL SIZES of gift bags for $1.oo! This one would have easily cost me $8 – $10 at any other store (KMart/Target/WalMart, etc.) so I was thrilled. (You know me – I love a good bargain!). In a bowl combine the soup, sour cream, taco sauce and chilies. In ungreased shallow 2 qt. baking dish, layer 1/2 chicken, soup mixture, cheese & tortilla chips. Repeat layers. Sift flour and corn meal; measure and add soda, cream of tartar,salt and sugar. Sift again. Add beaten egg, cream, milk and melted shortening. Beat thoroughly. Pour into a 9×9″ greased pan. Bake 20 minutes. Time to get started FINISHING ‘the’ afghan! Hope you have a great day – remember to treat yourself to something ‘good/tasty/fun’ today! Read a book, take a short nap, sit out in the sun, put on your favorite perfume just for you, polish your nails, grab a cookie, eat some of your favorite yogurt, listen to one of your favorite pieces of music, watch an old movie – these are some of MY favorite ‘treat yourself’ things – give one a try! 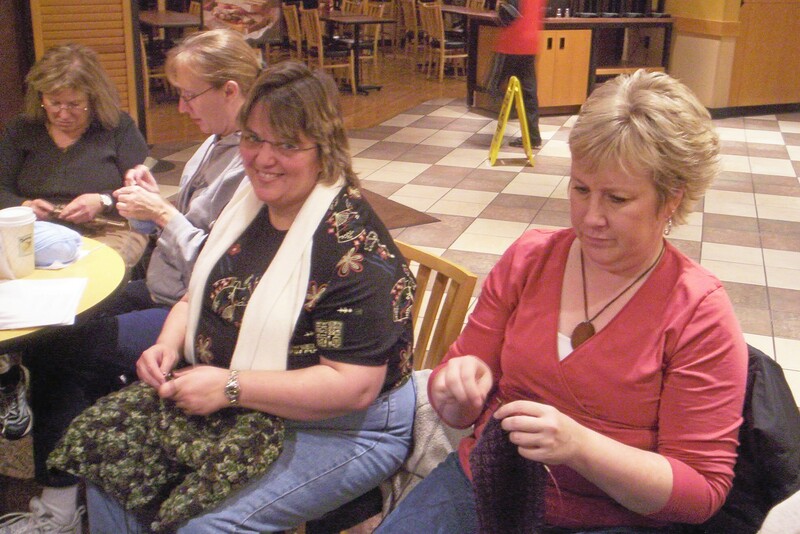 Last night at Knit Night my last ‘square donor’ brought in her square; you remember-the one that ‘special ordered’ yarn? It’s very unique – she knit together regular red yarn with ‘fun fur’, making a very ‘fluffy’ square. Our only problem? It’s 11 inches square instead of the required 10; I asked her if she would feel bad if I re-knit it to 10 inches and she said: “No, do whatever you need!” Today I pulled out the stitches (done in “Grandma’s Favorite” diagonal pattern) and re- knit it, using smaller needles; just finished and my fingers are sore! I’m guessing the manufacturer was using the term ‘fun’ to label the look, not the knitting capabilities – this stuff is really fussy to knit with. Picture knitting matted strands of hair; it sort of reminds me of when I have difficulty brushing my waist-length hair because of mats. Don’t get me wrong – the yarn really LOOKS nice when knit up, it’s just that it consists of a very fine main thread to which these 1/2 inch long fibers are connected making a ‘fluffy’ appearance when knit up. 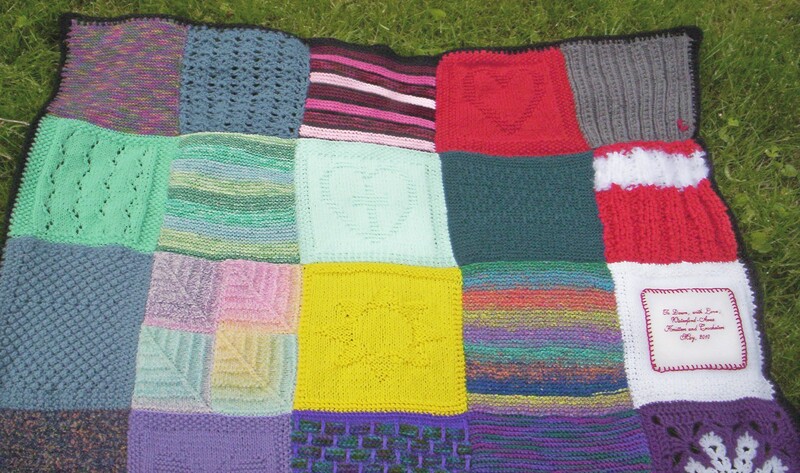 I’m just grateful all of the squares are now in my possession and next on the agenda is sewing the rest of the squares together, then crocheting the border. On a difficult note – our cat is now exhibiting signs that his urinary tract might be blocked – again; vet appointment scheduled for 2 hours from now. Not much else going on right now, am going to take a quick break before starting the square-sewing. Hope you’re having a good day; it’s 43 chilly, grey degrees today; doesn’t feel much like Spring. Oh well – better times are coming, right? Rainy Day here . . .
but that’s OK. Yesterday was a gorgeous day, perfect temperatures; even strolled around the backyard and picked a few tulips and some Forget-Me-Not’s to put in vases in my kitchen window. I love the cheery-ness (is that a word?) of flowers peeking out at me while I do the kitchen chores – makes me smile. 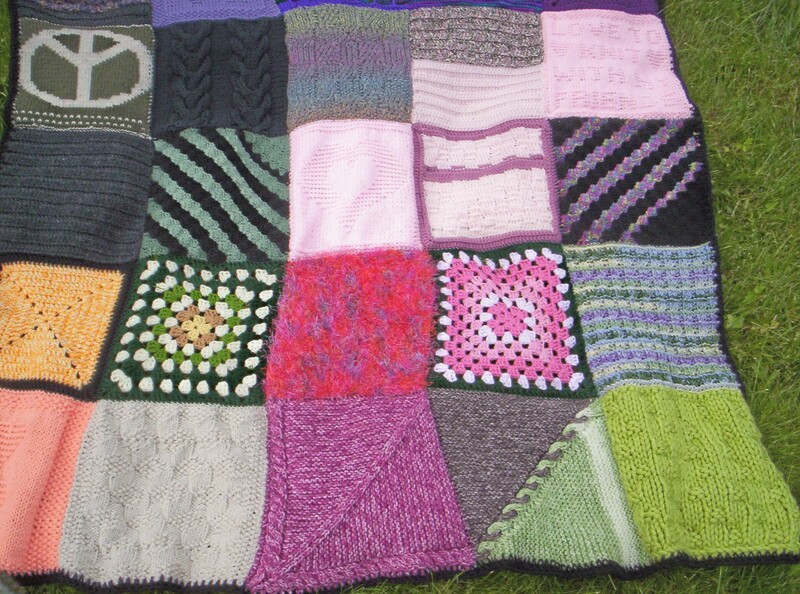 I’ve been working at/on the friend afghan on & off for about a week now. All of the squares are finished (except one . 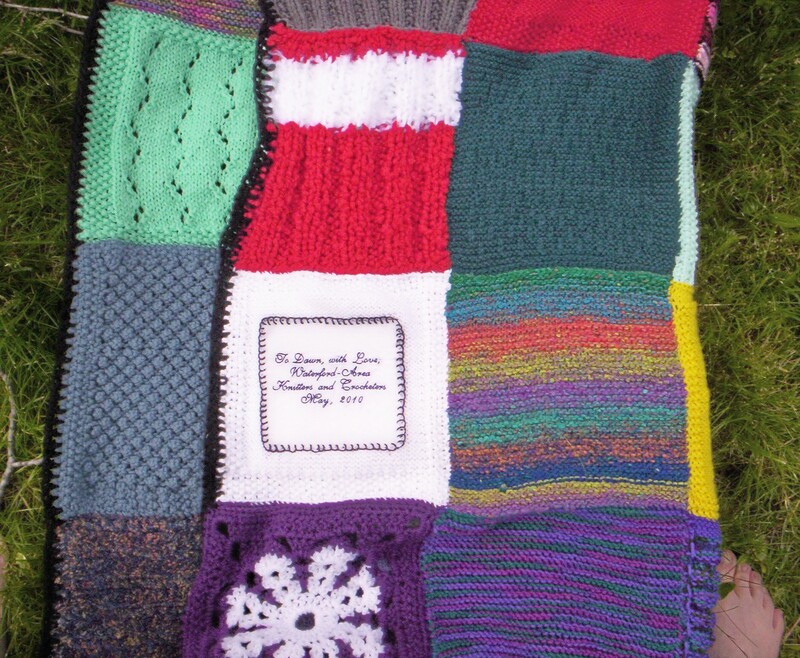 . . and I’m REALLY hoping said square-creator gets hers done before May 25th when I’ve scheduled the delivery). 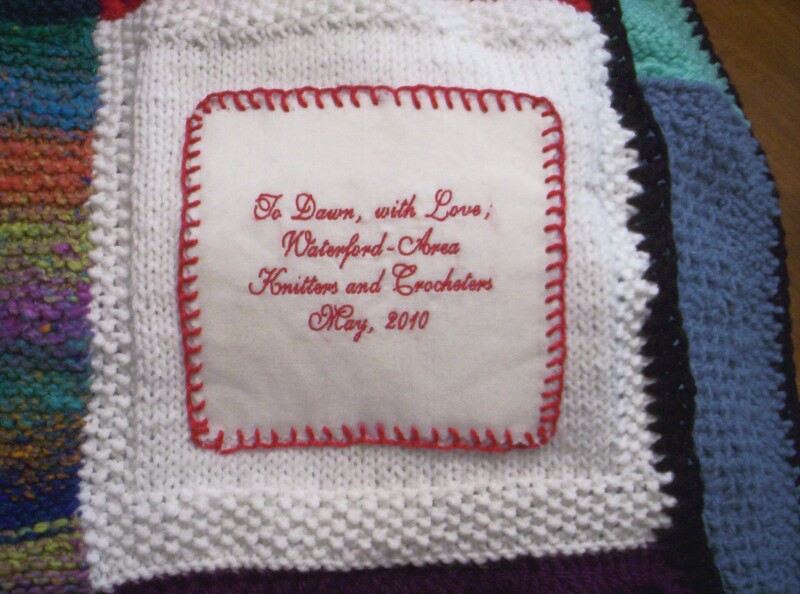 My neighbor called yesterday and apologized that she had great difficulty making the embroidered square for me. I told her it was OK (thinking “Guess I’ll have to HAND EMBROIDER that, myself”) when she then told me she took it to her friend who owns a large, COMMERCIAL embroidery company and asked her to do it for me! I told her I’d pay her/both of them, but she told me no. She also said that it should be done Wednesday, so that’s good! I will make one comment on the afghan: it’s going to be very BIG and VERY HEAVY! 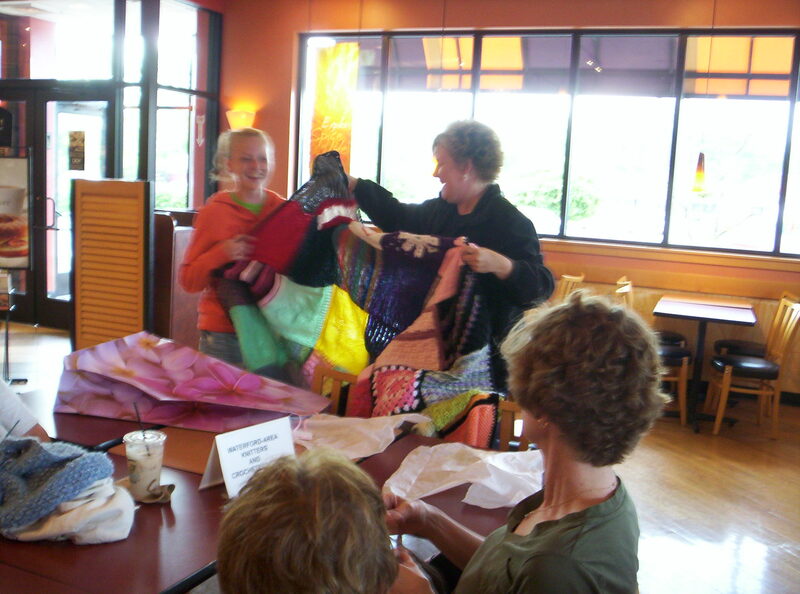 The colors are melding well and there’s lots of variety in the stitches/patterns – I’m sure she’ll love it. gently apply a thin layer of melted chocolate to your baked pie crust before assembling a BANANA CREAM PIE – the chocolate prevents the cream filling from making the crust soggy! (you really don’t taste the chocolate). Got on the scales today and was shocked at the numbers: time to really pare down the treats/eats! Not gonna tell ya the numbers, just that I was NOT pleased with them, for sure! Here comes the cottage cheese, again. While chatting with my neighbor yesterday we both discovered that we’re alike when it comes to procrastination about crafts. She has many pairs of pants which require shortening and I admitted I still have that one embroidery project I never finished (featured it, with photos, many blogs ago). Since I know that my friend’s afghan project will soon be coming to an end, I decided there’s ‘no time like the present’; promptly went upstairs and dragged down the embroidery and began working on it. It’s been well over 5 years since I’ve worked on it and it sure seemed strange holding such a tiny sewing needle and working with only 2 strands of embroidery floss at a time compared to the size 10 knitting needles and worsted weight yarns! Finished about 3 1/2 leaves then put it down for the evening. When I thought about the fact that (a) I’m not getting any younger (b) if I had to choose, my eyesight would probably ‘go’ before my sense of touch and (c) do I really want to leave this project unfinished, if perhaps I should expire? those questions/statements brought me to the decision that I need to complete this project. I will, in all probability, be able to knit/crochet well into my older age, BUT the ability to see tiny stitches and use such a fine sewing needle might NOT be available as I age. Yes, it’s a rather gruesome thought, but I’d rather have the completed project to pass down to others, than a 3/4 ‘s finished embroidery hoop-filled project that no one will (in all probability) ever finish. 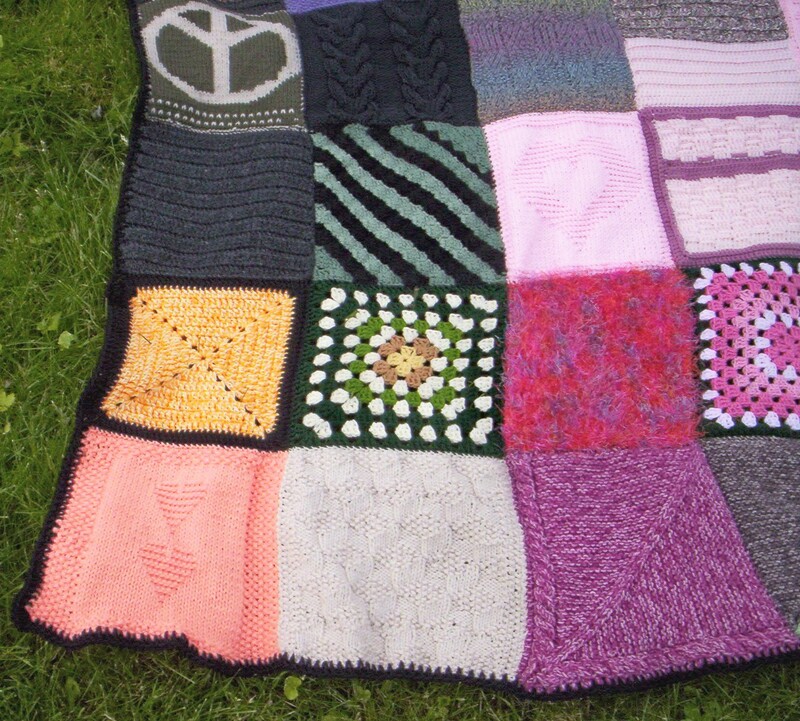 Currently I have three ‘projects’ which require work: (1) the embroidery (2) 1 more 12-inch square for the “Magic Hugs Squares” project and (3) the constant/ongoing “Ghana Project/Key of Hope” squares/afghans. 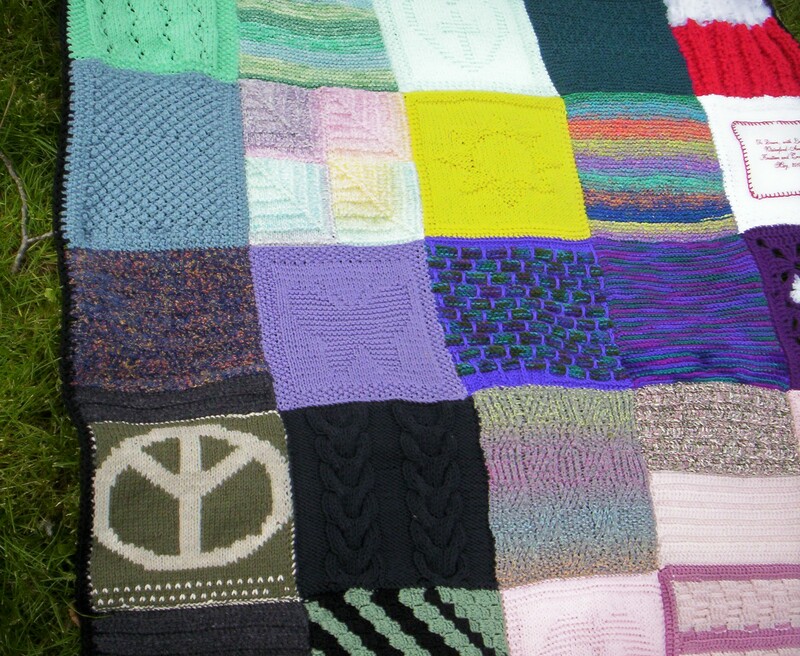 There are now 26 finished afghans awaiting distribution between the two charities, so I’m sort of ‘taking a break’ from working on them, knowing I’ll pick them up again soon. Hope you’re having a great day, even IF it might be raining. No matter what the weather, remember to have a little sunshine in your heart, a smile on your face and try to ENJOY your day!